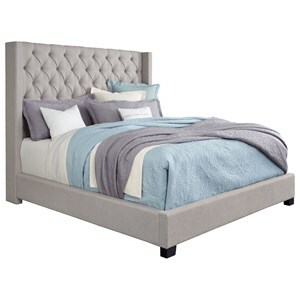 This upholstered bed will be a great centerpiece for your bedroom. 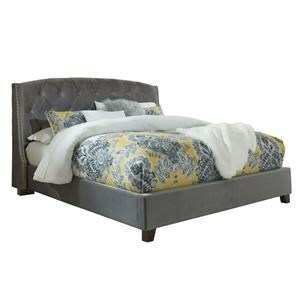 British khaki tan fabric in the Brown Bourbon finish or a tufted silvery gray fabric in the Silver finish decorates the headboard and adds comfort. 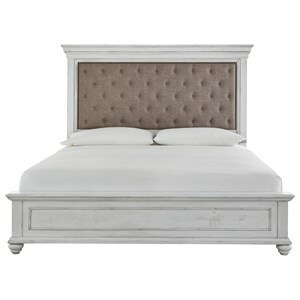 Square turned feet, cove corners and decorative beading give this piece a unique elegance. 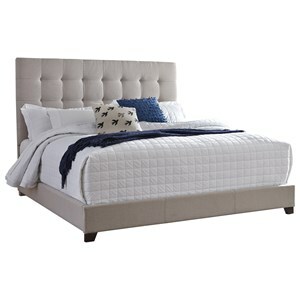 The Windsor Silver Upholstered Queen Bed with Cove Corners by VFM Signature at Virginia Furniture Market in the Rocky Mount, Roanoke, Lynchburg, Christiansburg, Blacksburg, Virginia area. Product availability may vary. Contact us for the most current availability on this product. Handles & Hardware Cast metal ring pull and knob hardware is finished in an aged brass patina. 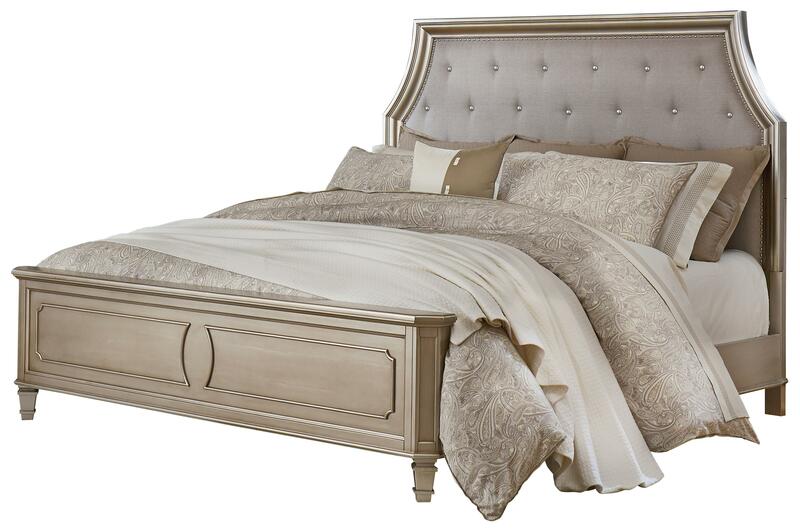 Create a sophisticated bedroom with this collection. The rich bourbon brown or glam silver finish, canted corners and square turned feet give it a classic look, while aged metal hardware adds unique charm. Drawers feature stained interiors and fixed felt liners in the top drawers to keep your jewelry and other precious items safe. The Windsor Silver collection is a great option if you are looking for Traditional furniture in the Rocky Mount, Roanoke, Lynchburg, Christiansburg, Blacksburg, Virginia area. Browse other items in the Windsor Silver collection from Virginia Furniture Market in the Rocky Mount, Roanoke, Lynchburg, Christiansburg, Blacksburg, Virginia area.